Accommodations are a key component of special education. Much like a wheelchair ramp allows more people to access a building, classroom accommodations allow more students to access the general curriculum. For example, if a child has dyslexia, text-to-speech software that reads aloud the words on a computer screen can help him access material that is at a higher level than he could read on his own. Some students receive accommodations on standardized tests as well classroom tests. Getting extra time to complete tests is a common accommodation. 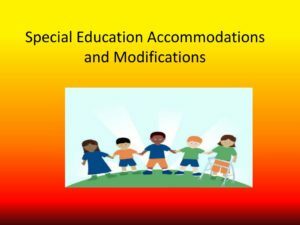 It’s common for a student to receive both modifications and accommodations. Some students may receive one type of support but not the other. And some students might not need either. Here are examples of common accommodations and modifications.